As a member of the EU, the UK participates in around 40 free trade agreements with over 70 countries. Businesses in the UK, EU and partner countries receive preferential market opportunities through these free trade agreements. To date, the Government has published a series of 106 technical notices to help businesses prepare for a no deal Brexit. It has now issued what it describes as an ‘overarching framing notice’ explaining its plans to ensure continuity for the UK’s existing trade agreements in the event of a no deal exit from the EU. The UK has reached agreements with Iceland, Liechtenstein, Norway and Switzerland on separation issues. Trade between the UK and EEA/EFTA countries was worth almost £30 billion in 2017. The deal protects the rights of 17,000 UK nationals living in EEA/EFTA states and 15,000 EEA/EFTA nationals living in the UK. 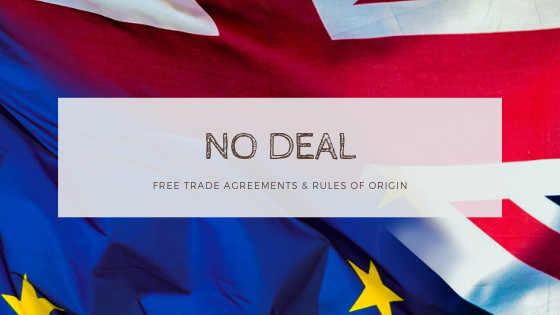 Rules of Origin will become increasingly important post-Brexit to establish the economic nationality of goods and whether they meet the criteria for zero or reduced tariff rates in Free Trade Agreements. Currently, there are no Rules of Origin requirements in EU-UK trade due to the UK’s membership of the EU Customs Union. Should the UK Government’s Facilitated Customs Arrangement be ratified, there will continue to be no routine requirements for Rules of Origin on trade between the UK and EU. However, businesses will use Rules of Origin to access lower UK tariffs on trade with the rest of the world when exporting to the EU. These rules will also need to be agreed in any other free trade deal that the UK agrees with another country.